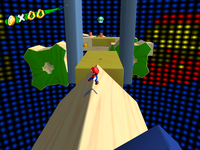 Red Coins in Ricco Tower is the bonus ninth episode of Ricco Harbor in Super Mario Sunshine. It can be accessed by replaying The Secret of Ricco Tower. Two are over the first set of rotating platforms. Two are on the walls over the center platform. The player has to use Wall Jumps or the Rocket Nozzle to reach them. One is over the center gear platform's path. Two are over the smaller rotating platform after the gears, with the final Red Coin being over the larger platform. This page was last edited on June 9, 2017, at 19:54.